In his first two NHL seasons with the Columbus Blue Jackets, William Karlsson scored a grand total of 15 goals and 30 assists. Those are not exactly superstar numbers, so the Blue Jackets made Karlsson available in the expansion draft last summer, and the Vegas Golden Knights snatched him up. Well, in his first season in Sin City, Karlsson suddenly turned into an NHL superstar. The 25-year-old Swede scored 43 goals during the regular season, good for third in the NHL. Then he helped the expansion Golden Knights reach the Stanley Cup Finals with another seven goals and eight assists in the Stanley Cup playoffs. While the Golden Knights currently trail the Washington Capitals 3-1 in the Cup Finals, Karlsson has officially established himself as the Golden Knights’ first true star. And he’s got himself a bombshell celebrity girlfriend, too. 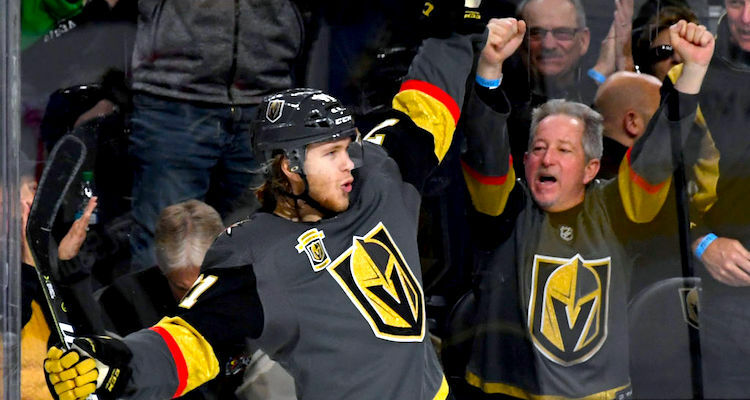 This week the New York Post pointed out that William Karlsson is dating Instagram model, former Bachelor contestant, and Las Vegas native Emily Ferguson. Their relationship hasn’t been a secret. Judging from her IG posts, Ferguson has been dating Karlsson since at least January. But for some reason nobody noticed until now. I’m sorry…I can’t hear you over the sound of how wrong you are. Good for you, William Karlsson.